Halla Tómasdóttir is the CEO of The B Team. Halla started her leadership career in corporate America working for Mars and Pepsi Cola. She was on the founding team of Reykjavík University where she established the Executive Education Department, founded and led a successful women’s entrepreneurship and empowerment initiative and was an assistant professor at the Business School. She was the first female CEO of the Iceland Chamber of Commerce and later went on to co-found an investment firm with the vision to incorporate feminine values into finance. The company successfully survived the infamous economic meltdown in Iceland. 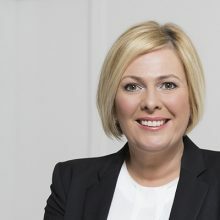 In 2016 Halla was an independent candidate for the President of Iceland. She entered a crowded field of candidates and finished as the runner-up with nearly 30 percent of the vote. Halla has served on for-profit and non-profit boards in education, healthcare, finance and consumer products. An active change catalyst, Halla was a founding member of the National Assembly held in Iceland in the wake of its financial collapse, where a random sample of the Icelandic nation discussed its values and vision for the future. She also founded and chaired WE 2015, a global dialogue on closing the gender gap. Her work has led her to the TED stage twice and she has delivered keynotes and participated in dialogues around purpose-driven and principled leadership for companies and conferences around the world. In 2011, Newsweek named her to a list of 150 women who shake the world and following Iceland’s Presidential Elections in 2016, The New Yorker called her A Living Emoji of Sincerity. Halla holds an international MBA degree from Thunderbird.